Kenya Healthcare Federation (KHF) 3rd Bi-Monthly Members Meeting. 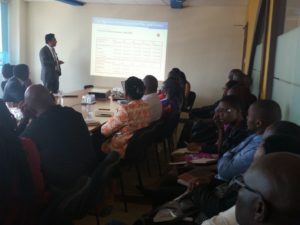 Kenya Healthcare Federation held the third bi-monthly member’s meeting on 30th May 2018 at Kenya Private Sector Alliance – Shelter Afrique Building, Nairobi, from 2:00pm to 4:00pm.The chairman Dr. Amit Thakker, started off the meeting by welcoming all the member, new KHF members, guests and partners to the meeting. Kenya Healthcare Federation Members meeting at Kenya Private Sector Alliance office at Shelter Afrique Building,Nairobi. The meeting reported on active Mininsterial Stakeholder Forum(MSF) involvement following the 2018 focus areas. KHF has officially been include KHF in the Health Act 2017 Implementation Committees and an introduction of overarching regulatory authority for medical plans (Health Benefits Regulatory Authority). A major focus was put on presidential round table (PRT), where Dr. Thakker updated the attendees on the current position of Presidential Round Table(PRT). KEPSA has held three Presidential Round Tables focusing was on the BIG 4 Agenda, the private sector presented on their key role they’ve been mandated concerning the big four agenda. There was an emphasy that corruption is a major setback while delivering the big four agenda and this needs to be addressed and H.E President Uhuru Kenyatta reiterated that he is not going to spare any details on the BIG 4 agenda because that’s his major focus for social economic till 2022.Manufacturing was first pillar that was discussed where it was given much time and attention .one of the key areas that will be focused on in manufacturing is regulations. It was agreed that affordable housing will be the second one, Affordable healthcare will be third and food security will be the last one. While focusing on Public-Private Partnership, it was noted that there has been a mismatch on the role of government and private sector where both sectors don’t have a clear understanding of their functions. This has been a major setback for growth and function of Public Private Partnership and hinders the growth of GDP. Dr. Thakker emphasized that the major gap while enhancing PPP growth is the lack talent in both sectors. Dr. Thakker however, informed the attendees that he had a discussion with the Health CS Mrs. Sicily Kariuki where he suggested that the communication strategy should be revised because the current one is very weak. There was a clarification on the health agenda where it has been mistook that the health agenda states “Achieving universal Healthcare” but the correct one is “affordable healthcare for all” where the ministry of health looks at scaling up NHIF in order to reduce out of pocket by Kenyans while accessing quality and affordable healthcare. KEPSA highlighted that it’s important to put the poor at the fore front while strategizing and delivering quality and affordable healthcare. Kenya Healthcare Federation was asked to prepare and present a strategy on how the private health sector will contribute towards achieving Universal Healthcare. (KEPSA) has put together five key areas to focus on while preparing for the next PRT as follows, the private sector must speak with a unified voice as it pushes its agenda at the Presidential Round Table(PRT), Ministerial Stakeholder Forums(MSF) and other Public Private Dialogues(PPD) platforms. KEPSA leaders to support and engage in the BIG 4 pillars in the preparatory activities so as to get tangible business priority issues tabled at the roundtable. The key Public-Private Dialogue Engagements that KEPSA has prioritized within the next month that all feed into PRT include: Judiciary Roundtable, Speakers’ Roundtable and Council of Governors. The structure of the next PRT presentations to mirror the BIG 4 McKinsey document already prepared by the government, Identify specific industries that will deliver on the agenda. What private sector will deliver, Specific challenges, the interventions we are seeking from government, the impact on jobs, sector growth projection, enterprises to be created and a quantum of additional investments. KHF has organized County Stakeholder Forum (CSF) for Health that will engage seven counties namely: Kirinyaga, Mombasa, Nairobi, Uasingishu, Kisumu, Makueni and Isiolo.The aim of the forum is advocacy towards achieving Universal Health Coverage, where KHF is directly engaging the CECs to advise on what should be put in place inorder to achieve UHC. During the county engagement, it was well noted that the counties have been focusing on primary Health Care. Dr. Amit Thakker highlighted that if the County Stakeholder forum is well implemented there will be an improvement in the delivery of quality and affordable healthcare. The Nation Media Group presented on upcoming National Leadership Forum Themed: Universal Health Care, which will take place on 5th July at University of Nairobi Auditorium. Mr. David Aduda from Nation Media Group highlighted on the importance of KHF participating in the Forum in order to present a unified voice of the private health sector.